Luc FERRARI: Etudes aux accidents (1958); Etudes aux sons tendus (1958); Visage V (1958-59); Tête et queue du dragon (1959-60); Tautologos 1 (1961); Tautologos 2 (1961); Und so weiter (1965-66). Gérard Frémy (piano). EMF CD 037 (http://www.emfmedia.org/). Available from CDeMUSIC (http://www.cdemusic.org/). Luc FERRARI: Cycle des Souvenirs (Exploitation des Concepts No. 2) (1995-2000). Blue Chopsticks BC8 (http://www.dragcity.com/products?filter_label=BC/). 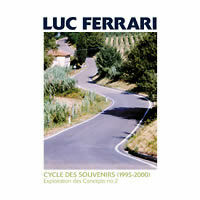 These two CDs span forty years of Luc Ferrari’s career. EMF has reissued seven early pieces, frenetic gems of musique concrète, and Blue Chopsticks presents a new work, Cycle des Souvenirs, an ambiguous and inviting panorama. Both discs are addictive. OK, I’m a registered Luc Ferrari fan, for evidence of which, see here. I’ll try to restrain my enthusiasm and channel my energies towards providing a context for these pieces and giving a shape to Ferrari’s career. Charmed at hearing Ferrari play the piano, Pierre Schaeffer invited him to join the Groupe de Recherche de Musique Concrète (GRMC), the studio Schaeffer and Pierre Henry founded in 1949. Ferrari arrived at the GRMC in 1958 just as it was falling apart. He watched Henry pack his bags and go. Schaeffer renamed the remains the Groupe de Recherches Musicales (GRM) and Ferrari became a founding member. Schaeffer, Ferrari and others recorded and categorized the sounds of found objects, including broken pianos and junk. Their modus operandi was a complete contrast to the WDR electronic music studio in Cologne, Germany, where Stockhausen, Eimert, and others used purely electronic sounds as their raw materials. 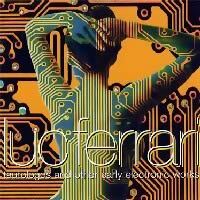 Created in June and July of 1958, Ferrari’s first electroacoustic compositions are bristly and abstract, populated with bits of dissected and juxtaposed sounds. Etudes aux accidents is a cross between a pinball machine and a prepared piano. Etudes aux sons tendus works with a greater assortment of material including the pinball/piano of the other etude and truncations of resonating objects. Representative of the musique concrète of that time, we hear sounds purged of recognizable associations and assembled as unusually as possible. Tackling form and scale, Visage V passes the 10-minute mark. (Previous works in the series were composed for acoustic musical instruments.) Here we sense Ferrari’s joy at recklessly tacking together unrelated events. The three-movement piece opens with an abrasive salvo before settling into a linear sequence of gestures. In the central movement, we witness the force of Ferrari’s humor in what could be a score for a cartoon. The other early works are similarly sprightly and manic. Tête et queue du dragon is in two parts with discernable subsections wherein sounds are explored for several seconds. Stringed instruments are transformed beyond recognition in a stunning display of studio technique. Muffled drums at the start suggest a similar gesture in Varèse’s Poème electronique (1958). Ferrari was taken by the premiere of Déserts (1954), and in 1955 crossed the Atlantic on a cargo ship to visit Varèse in New York City. Creating these pieces must have taken an incredible amount of work and effort. The hours and labor that went into the creation of an earlier cut-and-paste tape work, Cage’s Williams Mix (1951-53), is well documented. It’s only natural that Ferrari would have sought a method to organize and structure his time in the studio. The Tautologos series are among Ferrari’s first rule-based compositions. He described the method as “repetition by deviation.” Others have detected the seeds of Minimalism in these 1961 works. Imagine how Minimalism would have been received had it been labeled Tautologism! It’s difficult to hear what’s being repeated in Tautologos 1 and 2. The single-movement Tautologos 1 makes extensive use of synthesized organ sounds, presumably manipulated at different speeds. In the three-part Tautologos 2, distinct sections consider similar types of sounds and then move on. Occasionally a theatrical gesture such as the metallic flourish that closes the second movement will provide shape. The repetition is more overt in the next work of the series, Tautologos 3 (1969), for 11 instruments and tape (Blue Chopsticks BC1). Ferrari’s “repetition by deviation” is more easily detected in a later work for harpsichord and tape, Programme commun pour clavecin et bande magnétique of 1972 (Adda 581233). Beginning quietly and punctuated by silence, the harpsichord’s opening gestures are like an insect’s twitching, perhaps foreshadowing the blanket of crickets at the close. One of the keyboard figures becomes a drone picked up by the tape. A gentle pulsing emerges, growing hypnotic and persistent. The harpsichord’s simple gestures gradually evolve towards the work’s stark end where instrument and tape shadow and mimic each other until their differences vanish. It’s a wonderful composition, one of Ferrari’s best and one of the most successful of the instruments-with-tape genre. Perhaps owing to its success, the same tape appears in the 1978 A la recherche du rythme perdu for piano, optional percussion and tape (Adda 581156). This EMF disc reissues one of Ferrari’s first instrument-and-tape works, the irreverently bombastic, incomprehensible and concerto-like Und so weiter, which pairs piano with tape. Slapstick outbursts make this the first and last word on combining instruments with prerecorded sound. One would never have guessed that Ferrari studied piano with Alfred Cortot. The first part begins with many pianists banging out chords. It’s difficult to tell what Frémy is contributing. Is he the performer for the source piano too? The central movement surprises with its incorporation of natural sounds. Crickets look forward to the 1967-70 masterpiece Presque rien no. 1 ou Le lever du jour au bord de la mer (Musidisc 245172), as well as Programme commun. I suspect that most of Frémy’s work occurred in the piano’s insides. The final movement splashes chords and clusters before exhausting itself like a windup toy. While Ferrari was at the GRM, Schaeffer’s research led towards a solfège, a systematically developed massive encyclopedia of sounds organized into classifications destined to function as pure sounds divorced from their real-life associations. It’s hard not to imagine the wily Ferrari finding this as stifling as other composers did. Yet he speaks fondly of his work with Schaeffer. Perhaps his current preoccupations are a reaction to this, or perhaps even a logical development. With the 1963-64 Hétérozygote (BVHAAST 9009), Ferrari turned a corner into the realm of essentially autobiographical “anecdotal music.” Sounds were no longer diced and mangled, appearing rather as themselves, sometimes looped and layered to create textures. An air of leisure and mysterious calm replaces the manic. Studio tricks and techniques are now behind the scenes. A mature Ferrari electroacoustic piece puts one in an exotic bazaar where sights, sounds, and smells roll past, saturating your clothes, sticking to your shoes. Sometimes we eavesdrop on intimate conversations in an unfamiliar language or hear a snip of a familiar tune endlessly repeated. What tantalizing experience lies just out of reach? Back home, you’ll find strange seeds in your pockets, a stain you can neither identify nor remove, and a tune you don’t even realize you’re humming. Similarly, in his non-electroacoustic music, dismissing preoccupations with form, the composer scripted improvisations (the Spontané series and some of the Société works), and wrote music patterned like histories and diaries, modeled on structures in the natural world, e.g., Histoire du plaisir et de la desolation (Adda 581156), Journal intime, Comme une Fantaisie dite des Réminiscences (Montaigne MO 782110). The onset of Ferrari’s mature style coincided with an amicable departure from the GRM to become a filmmaker and sound engineer. Between ’64 and ’66, he collaborated with Gérard Patris on a series of television films, The Great Rehearsals, whose subjects include Messiaen, Varèse, Stockhausen, Hermann Scherchen and Cecil Taylor. It’s crucial to realize that Ferrari is an accomplished filmmaker. Ideas, projects and techniques from one discipline infuse the other. Since 1961 his activities have included music for his own films and those of others. Other planned Exploitation des Concepts projects include Tautologies et Environs for 14 amplified instruments and Presque rien avec instruments. What does Cycle des Souvenirs sound like? It’s simultaneously charming and bewildering. We hear gentle, breathy murmuring of women speaking in French, German and English. There are street and outdoor noises, interior sounds such as footsteps, clattering dishes, and café noises. Music includes drum loops, synthesized strings, piano, jazz band and orchestral gestures that go nowhere. We’re in a train station, an amusement park, a forest, a shopping mall, a market, the seaside, or taking cover from a thunderstorm or fireworks. Rich, spatially distributed sounds cover a wide range of frequencies. There’s always something going on. I can’t speculate on meaning except to observe that the experience is both engrossing and voyeuristic. Ferrari fans will love it. Newcomers will fall through a trapdoor into a place they never knew existed. A few of Ferrari’s first musique-concrète pieces appeared on a BAM LP whose cover was simply a photo of concrete with “musique concrète” superimposed in red. Actually, the concrete looked more like a slice of bread painted white. Some have since been reissued, including Tête et queue du dragon, which can be found on Early Modulations (Caipirinha CAI.2027). These two discs are exciting additions to Ferrari’s infrequently accumulating discography. Sonic content aside, they also perpetuate other themes that run through Ferrari’s work: a persistent inscrutability and a fascination with women. (NB: Ferrari’s wife Brunhild Meyer has collaborated on many projects throughout the years.) Ferrari begins his notes for Cycle des Souvenirs by insisting that he’s telling us the truth. Maintaining this candid demeanor into the last lines, he admits that some of the details he’s just given (dates, circumstances, etc.) were completely fabricated. Notes for other recordings and compositions are often contradictory or elliptical. Some are numbered and form a series by themselves. Why can’t a man whose art is autobiographical reinvent himself? Ferrari’s interest in women reveals itself in the artwork of these and other recordings. Surely the choice of graphics isn’t up to the art director. While some compositions are explicitly about women, e.g., Et si le piano était un corps de femme, Presque rien avec filles (Musidisc 245172), Unheimlich schön (Metamkine MKCD008), Danses Organiques (Elica MPO-3340), Chansons pour le corps (mode 81), sculptures, unclothed mannequins, parts of the body, etc., appear on many Ferrari CDs, e.g., mode 81, Musidisc 245172, and EMF CD 037 above. The kiddies needn’t leave the room. There’s nothing in or on these two discs that might offend.